My next topic with my year 10 science class is evolution. Once again, I’d like to embed games based learning into the topic. I’ve been exploring possible games for evolution a while now and have decided on Spore. Spore is a multi-genre, single-player god game developed by Maxis and designed by Will Wright, the same guys who are responsible for The Sims. 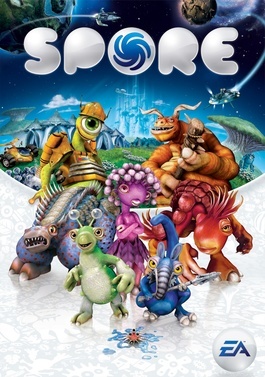 Spore allows a player to control the development of a species from a single-cell, microscopic organism through to its evolution as a social tribe, which eventually evolves to an intergalactic society. There are 5 stages in the game: cell stage, creature stage, tribal stage, civilization stage and space stage. I don’t want my students to learn evolution from Spore because there’s definitely some bad science in it. While there are some bits that are similar to evolution, Spore perpetuates some very common misconceptions about evolution. For example it presents evolution as individual organisms changing. There are scenes where you see your creature physically transform into another species, which is not what evolution is about. Evolution is about a species changing as a whole due to individuals surviving or dying based on whether they have adaptations to the environment. In evolution, adaptations come about randomly. However in Spore, the player gets to choose what characteristics their Spore creature has. For example, when you realise that there are many creatures trying to eat you in the creature stage, you’ll put more defences or stronger legs on your creature so it can defend itself better. This is more like intelligent design, not evolution. So if Spore doesn’t have good science, why do I want my students to play it? Looking at the higher levels of Bloom’s taxonomy, being able to critique and evaluate are near the top. What I want my students to do is to play Spore then make a game review to critique the scientific accuracy of the game. To do this well they will need to understand evolution well and overcome the common misconceptions. I’m going to set a task where they need to work in groups to play the game, learn about evolution from other resources and make a video game review on the scientific accuracy of Spore. I’m going to start this in 2 weeks. Any feedback or comments would be greatly appreciated. This entry was posted in games-based learning by Alice Leung. Bookmark the permalink. I’m particularly interested in how you will get the game to each student – will you buy multiple copies or have you organised a site license? I bought one copy for my laptop so students will need to work in groups and take turns. They will only play the cell phase. I looked up the copyright issues and to have a whole class playing I’d have to buy separate copies for each computer. I wanted to use Spore Origins on iPhone as it’s cheaper ($3 vs $50) but the iPhone version isn’t as strong on evolution. Wow! That’s great how you played Spore to relate to the student. We need more teachers like you.